"Neither rain, nor snow, nor sleet, nor hail shall keep the postmen from their appointed rounds.” That’s the slogan that all US Postal employees are to live by. With that in mind, The United States Post Office in downtown Indianapolis needed a reliable and efficient solution to insure they met their duties. At Andrew Jacobs Jr. Post Office, semi’s and mail trucks must go up an exposed ramp in order to reach loading areas. 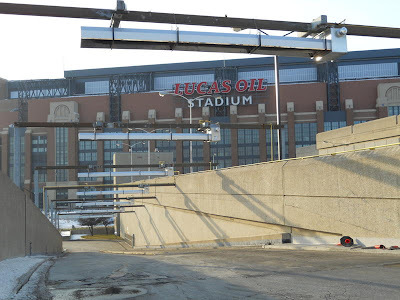 Unlike neighboring Lucas Oil Stadium, home of the Indianapolis Colts, they are not afforded the luxury of a roof that opens and closes as weather demands. During harsh Midwestern winters snow and ice often times builds up on the exposed ramp surface making it virtually impossible to climb. For this unique application Ambirad used 7 ultra high efficiency VSX series 140,000 btu U-tube heaters. Due to the complete exposure to the elements, custom enclosures were fabricated to protect the components of the heater. Ambirad’s standard stainless steel reflectors provide performance and reliability for the long term. Radiant energy insures that the mail will get to its destination regardless of the weather!